Many 19th-century London restaurants were modelled on their counterparts in continental Europe. Indeed, as the century progressed, more and more of them were run by European immigrants - most regularly French, Swiss, Italian or Polish. 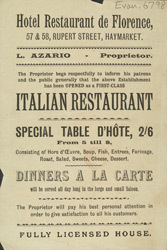 Restaurants like the one advertised on this leaflet were usually beautifully and intricately decorated, with large plate-glass mirrors, plush velvet curtains and ornate light fittings. They became known as restaurants in Britain largely to distinguish them from the dining rooms used by middle-class professionals and skilled workmen during the working day.